In getting the areas of figures, calculating the area of a square is probably the easiest. We can easily calculate the area of a square by squaring its side length . For example, a square with side length 5 units has area 25 square units. What about the area of a rectangle? Based on the finding the area of a square, our intuition tells us that it is the product of the length and the width. However, how do we prove that it is indeed true? In this post, we are going to discuss the proof of the area of a rectangle. We show that it is the product of its length and its width. 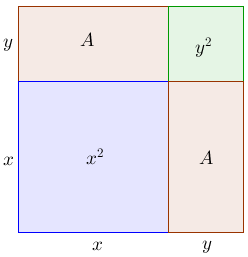 Theorem: The area of a rectangle is the product of its length and width. Consider the square below with side length units. The square is divided into four parts: two squares and two rectangles. We already know that the area of the two squares are and . We do not know the area of the rectangle yet because that is what we are trying to prove. But and are the length and width of the rectangle, therefore, the area of any rectangle is the product of its length and its width. Reference: Geometry by Edwin E Moise and Floyd L. Downs , Jr.
Nice! Its helpful for some of us (maths teacher). We really have to show students where the area came from. Thanks for your proof. But one thing pupil who aren’t aware (x+y)^2 at all how can we prove it?